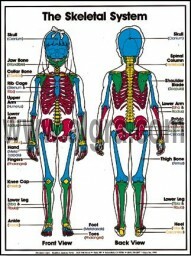 The Skeletal System Anatomy Poster is a colorful poster showing the front view of a girl and back view of a boy. Each major bone is highlighted in a different color to make identification and learning easy. This human anatomy poster for kids guide is a terrific teaching tool for any classroom studying the skeletal system. Poster of the Human Body detailing the Bones of the bodies anatomy for grades 4-6. 18" x 24" poster available in Paper, Laminated, and Framed.